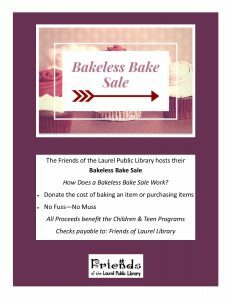 Instead of making or purchasing a baked good at a bake sale, make a donation to the Friends of the Laurel Public Library. Bring your donation (cash or check, payable to the Friends of the Laurel Public Library) to the library. All proceeds benefit the library’s youth programs.